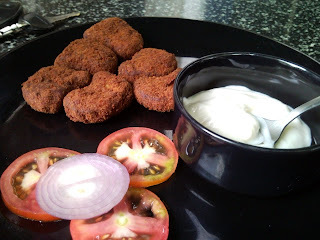 I am in Mangalore right now, basking in the joys of being pampered at home. For two weeks now, no cooking, cleaning, running behind junior. All I seem to be doing is gorging on Kuswar (traditional Christmas sweets) and all the yummy things that mom seems to be miraculously bringing out of her kitchen. And so when I today finally logged on to the virtual world, I thought it would be best for me to finish the reviews that I have been hoarding and get on to the Christmas goodies that I just have to showcase here. 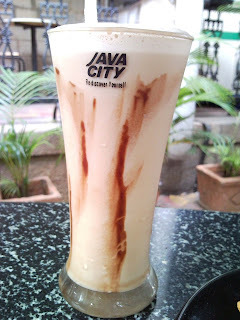 Java City in Jayanagar is part of this three-restaurant set-up that comprises, Annabrahma on the first floor and Chung Wah Opus on the the semi-open terrace. Java City on the ground floor has a nice open air space that runs around the entire building and is done up in customary wrought iron seating and green umbrellas. While the pastry counter is at the restaurant entrance, the kitchen is on the other end. We went there on a weekend for lunch and was surprised that the place was empty except for us. There were two of the wait staff, but it was a good 10 minutes before they approached us. 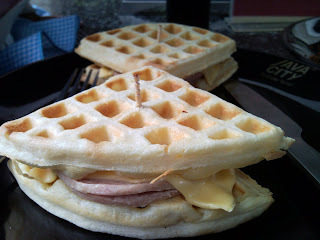 The restaurant was promoting waffles - savory and sweet. 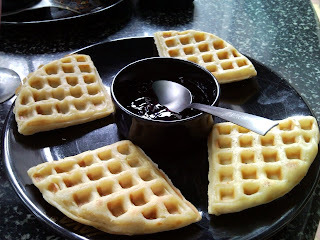 So I went for the chicken and cheese waffles while Sudhakar opted for the waffles with blueberry sauce. The waffles took a really long time in coming and were a total disappointment. They were definitely not freshly made but rather the heat and eat variety. This could be attributed to the fact that all chain restaurants often have a central kitchen from where food is packaged and dispatched. Mine had one measly slice of chicken folded in half and a slice of cheese. The whole thing was very chewy with absolutely no taste. As for the Sudhakar's, his came with a small cup of blueberry sauce, that sadly did not do anything to up the taste factor. For Anoushka we ordered chicken nuggets, which again was a measly lot served with ketchup and mayonnaise. It could easily have been a packet of Venky's or Suggies or Bamburries frozen foods opened up and served. 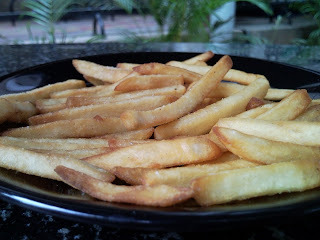 You can't go wrong with fries and thankfully this place didn't. 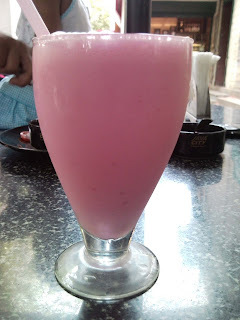 To drink, I had a berry and yogurt drink while Sudhakar had a cold coffee, the name of which I don't remember. Both were nice without being spectacular. Funny though that despite Java City being a coffee place, we were told that hot coffees of any type were not available. Dessert was an apple pie which looked a bit hard when it came. And after the first bite, it was safe to say that I was not wrong. 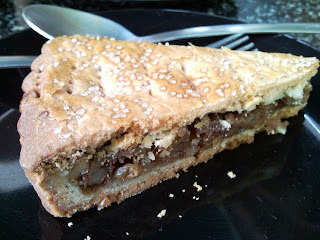 The filling though had more apple than raisins which is hardly the case with Coffee Day which should reconsider naming their apple pie to raisin fest. Overall, would prefer the other two restaurants in the building. Service is oh-so-slow and from what we had, the specials are nothing to talk about. The time between ordering and the stuff coming to the table was an eternity and we spent the time rolling over laughing at the typos in the menu. Again the loo here is only the one on Chung Wah Opus.